Application for new registration is available via mail, fax or email. Down load attachment will be available soon. Application for transfer of current registration is available via mail, fax or email. Application for DNA verification is available via mail, fax or email. 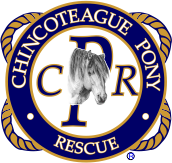 Transfer for ponies currently registered with CPA and NCPR is available via mail, fax or email until June 1, 2013.
are donated to the Chincoteague Pony Rescue, Inc.
auction, slaughter, neglect and abused Chincoteague Ponies. Funding for expense of transportation, veterinary care, farrier, feed and hay.